Sit back in a luxury coach and let your guide reveal the wonders of the “Venice of the North”. See the neo-classical Royal Palace on Dam Square, the National Monument, the vibrant Albert Cuyp street market and much more. Admire the beautiful canals lined with magnificent 17th century houses and admire the pretty bridges, like the iconic “Skinny Bridge”. Then travel on to the glorious gardens of Keukenhof – the name actually means “Kitchen Garden” in Dutch, but don’t expect to find vegetables! Amazing Keukenhof is the world’s largest flower garden and you will be treated to a stunning display of spring bulbs in bloom. As you stroll along the meandering paths you will be greeted by rich carpets of daffodils, hyacinths, crocuses and tulips in a kaleidoscope of vibrant colors. Your super-value Amsterdam City Tour & Keukenhof Combo shows you not only the highlights of Amsterdam but also one of the world’s most famous gardens. Amsterdam is The Netherlands’ largest city. Settled as a small fishing village in the late 12th century, it became one of the world’s most important ports during the Dutch Golden Age. The wealth acquired in that time left a legacy of stunningly beautiful buildings and great art. • The famous “Skinny Bridge”, a typical Dutch wooden lifting bridge. Originally very narrow, the bridge has been widened over the years, but it remains one of Amsterdam’s most photogenic bridges. • The bustling Albert Cuyp street market. After the city tour, proceed for a visit to one of the many Diamond Factories for which Amsterdam is so well renowned and you will also stop for a picture at a windmill on the way. 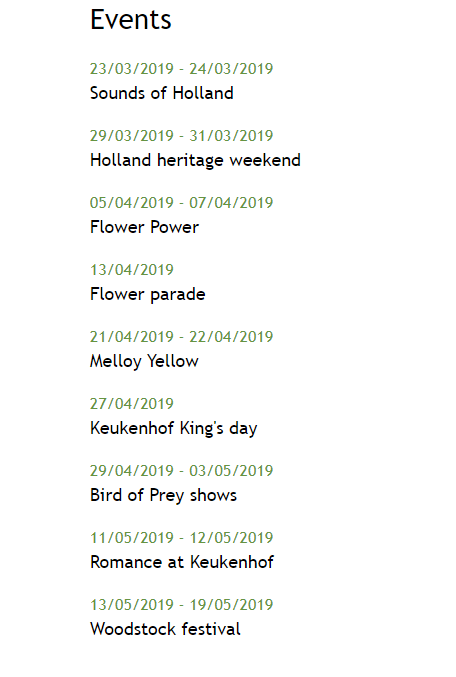 You will then visit the glorious spring gardens of Keukenhof, (the name means “Kitchen Garden” in Dutch because the area was once a source of herbs for a grand castle). Keukenhof is also known as “The Garden of Europe” and the 32-hectare park is the world’s largest flower garden. Keukenhof is renowned for its springtime flowers – approximately 7 million bulbs are planted annually. Wander along winding paths past sparkling streams, pretty ponds and a breath-taking array of blooms. A fresh display of spectacular blooms will be waiting for you around every corner. You will have around 3 hours to relax in the beautiful surroundings of Keukenhof before boarding your coach for the return journey to Amsterdam! This tour is a combination of two separate tours and you might have to change buses in between.